For the last few years, the people of Namavundu village have been relying on a dirty swamp to get water. This dirty water has had disastrous effects on the village’s health and well-being. The people of Namavundu came to us with this problem to see if we could help them. 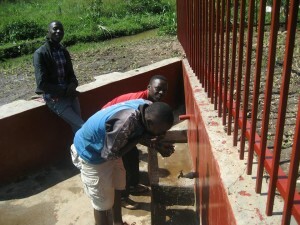 In October, we partnered with The Long Well Walk to start building a well and protected spring in this village. Now the whole village has clean water! In Uganda, approximately 12 million people don’t have access to safe water. Around 26,000 children die every year in Uganda from diarrhea and other diseases caused by unsafe water and poor sanitation. Many of us take water for granted, but for a large number of people in the world, having enough clean, safe, easily available water is just a dream. We are so pleased to be able to provide a clean water system in this village which will reduce disease and improve health and well-being for the whole community. We also used the official opening of the community well an opportunity to talk to the whole community about the importance of washing hands and keeping healthy. The people of Namavundu village said: “We thank God for this work that has been completed and we are so happy to benefit as a community.” We would like to thank The Long Well Walk for partnering with us in this project, and we would like to thanks all the community members and KCK volunteers who donated their time to help construct the well. There are several other communities that we work in where we are hoping also be able to provide clean water and sanitation solutions, and we are looking for individuals and organisations to partner with us in this. If you are interested in getting involved or would like any more information, please email info@kidsclubkampala.org.